The November 15th is the Proclamation of the Republic Day, a national holiday, and I was really in need of a day of rest. 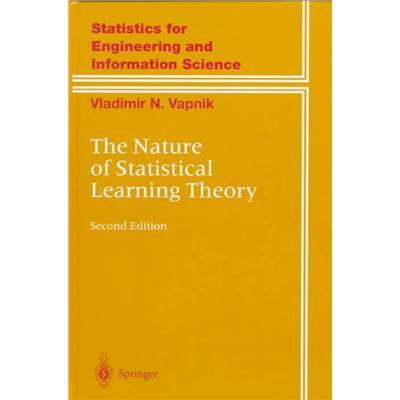 As I couldn’t be resting the whole day I spent some time reading this great book by Dr. Vladimir Vapnik, The Nature of Statistical Learning Theory. I’m not going to write a full review of the book, but I’d like to make some observation regarding some of his opinion that really got me. I really enjoyed the historical background in the research of the Learning Problem; as a newcomer and apprentice on the field I find it useful and wise to be well-informed on what has been going on. As Cosma Shalizi points out in this review, Vapnik’s view on the history of research in the field is very idiosyncratic, but nevertheless interesting. He expresses a great level of criticism towards the motto: “Complex theories do not work; simple algorithms do” and places himself in the side of the Theory guys. Of course it is very interesting to know how humans can learn. However, this is not necessarily the best for creating an artificial learning machine. It has been noted that the study of birds flying was not very useful for constructing the airplane. I claim that this affirmation does not intend to undermine this whole research program on Bio-inspired Learning Algorithms, but indeed to elucidate the actual role of this approach in the general setting of Learning Problem. That is to say, airplanes are not the same as birds, the material is not the same, the dynamics is not the same, the way they use energy is not the same, probably we wouldn’t be able to create a flying machine just by copycatting flying living beings. Nevertheless could be that some good ideas that later was incorporated into the flying machine was inspired by birds, as long as we understood the nature of a flying machine essentially as different from birds. My personal philosophy is more tendentious to the “theoretical proven” side than to “as long as it works”. I know that a lot of good ideas can emerge from heuristics and only a posteriori be well explained by theorists, nevertheless, I’m much more comfortable when I have ground theories to back me up.